Social science is the systematic study of human society and social relationships to predict social behavior. A comprehensive understanding of human psychological makeup and motives is crucial to deconstruct social behavior and address the multiplying social distress.This tutorial highlights the social and cultural biases inherent in mainstream social sciences and humanities today. It presents the Vedic approach and how it can transform the discipline in a fundamental way. Administration and Vedic ‘History’ – their global relevance for handling cultural diversity and conflicts. Hyderabad: Seminar Hall, GeneTech Pvt Ltd.
Delhi: Verity Software Noida or search “ISTQB centre” on Google Maps. Address: First floor, A108B, sector 58, NOIDA, U.P. Online via live interactive webinar from your home location. Online from your home location: ₹ 3000 (₹ 1,000 if student). How to Register: Fill in the online registration form. Prof. Dr. Nagaraj Paturi is a well-respected scholar with over 25 years of teaching and research experience in Vedic aesthetics, linguistics and cultural anthropology specializing in folk-classical (vedic) interface, as well as in Vedic civilizational thought. He teaches courses in Qualitative Research, Ethnography, Semiotics, Cognitive Cultural Studies to students of Design, Communication, Classical Dance, Business Management etc. employing Vedic Science approaches where applicable. A captivating orator, poet and rigorous thinker, Dr. Paturi has deep knowledge of both western and Indian concepts in Social Sciences and Humanities. Dr. Paturi is currently the Director of Indic Academy Hyderabad’s Inter-University Center for Indic Knowledge Studies (indicacademy.org). He is also an executive committee member and visiting faculty of the MIT School of Vedic Sciences, MIT-ADT University Pune INDIA (mitvedicsciences.com). He is on the board of studies of several Universities focusing on applied Vedic scientific studies including Chinmaya University and Vivekananda University. While the scientific community tries hard to keep the subjective bias out of its process, it is now well-recognized that the social and cultural background of the researcher can greatly influence the methodology adopted in pursuing knowledge and the conclusions drawn. Their influence is more pronounced in mainstream social sciences and humanities, which have largely evolved under European social conditions. The academic world has long recognized this influence and the importance of studying diverse indigenous knowledge systems in expanding human wisdom. However, for various reasons and biases, the Indic, especially Vedic dimension has been either largely marginalized or treated with an alien lens in mainstream discourse. This has deprived humanity of invaluable Vedic civilizational insights to its detriment. The knowledge areas covered by the present mainstream Social Sciences (Economics, Sociology, Anthropology, Political Science, Public Administration, History etc.) and Humanities (studies of culture, literature and philosophy) are covered by many indigenous knowledge systems too. 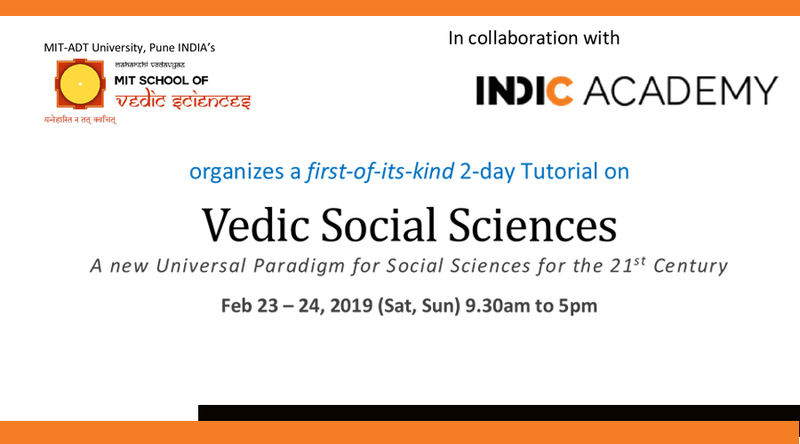 Indic, particularly Vedic Knowledge Systems, offer a very different perspective to each of these areas that is valuable for understanding and shaping human society. The prime contribution of Vedic knowledge systems is their holistic model of human psycho-physical Nature and how it affects individual and social behavior. There are numerous living examples of social organization validating the vedic model and its conclusions. Given the multiplying social ills and the limitations of mainstream social science models in addressing them, it is high time the Vedic perspective is studied by the academic community with an open mind. Indic Knowledge systems, particularly the Vedic systems, offer a global alternative paradigm in each of the disciplines of the present mainstream Social Sciences and Humanities, namely, Vedic Sociology, Vedic Anthropology, Vedic Economics, Vedic Political Science, Vedic Public Administration, Vedic ‘History’ etc. The Vedic paradigm can complement and enrich mainstream understanding of human behaviour to help effectively address humanity’s social, political, cultural and economic challenges.